Eggcrate Overlays Wheelchair Cushions can have a significant effect on your health and posture, particularly the more time you spend in your wheelchair. Comfort and complete relaxation are significant decision making factors while considering a new wheelchair back. If you’ve had an injury or surgery that affects your posture, you must be looking for a product that offers immaculate positioning, and Sportaid is where you will find it. Sportaid provides the necessary assistance in finding the best options for you. Browse through our huge selection of Eggcrate Overlays Wheelchair Cushions or feel free to call 1-800-743-7203 for help choosing the right option today. You'll be glad you did! Sportaid can save you as much as 33% on Eggcrate Overlays Wheelchair Cushions! 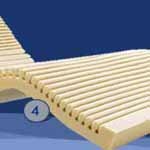 Find the Right Eggcrate Overlays Wheelchair Cushions for You! The ergonomically designed cushions at Sportaid promote upright posture and ease strain on the lower back. The lightweight back provides both support and positioning. Whether you choose Eggcrate Convoluted Mattress Overlays or the Geo-Matt Overlay, we assure you of complete convenience and comfort. You can easily choose and customize a wheelchair back to your preferences with the help of our deft guidance. Whether you are a new customer or someone who has been with us for a while, we guarantee satisfaction. After over 25 years in the business helping people find Eggcrate Overlays Wheelchair Cushions at the lowest prices, we continue to lead the industry! We carry a large selection of wheelchair cushions, wheelchair parts, and accessories. We are capable of beating any competitor's advertised price, just call! Our customer service staff has over 50 years of experience, plus over 90 years of combined wheelchair use experience. We look forward to working with you!